Dogs enriched the lives of those around them so much and give you unconditional love and joy. 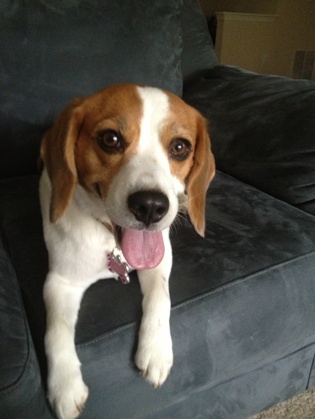 4 years ago I got Mia-my beautiful, loving, special , playful- beagle dog. It wasn't an easy task but after a long search I found her in North Carolina drove all the way there and brought her home. I am so thankful to have her next to me. It was a mission for me to give her the best and reward her for being so special. She is the reason and the inspiration that Puppy Yummy was created and is now a reality. But , let me tell you how everything started. I was working at the time with a company specialized in the distribution of vitamins and antioxidants supplements . We sold them by working very close to a well known doctor specialized in the anti-aging area. After years of working with them and the learning experience about how good supplements and healthy diets impact our lives, I wanted to combine all the knowledge and somehow adapt it to my dog since they should consume pretty much the same food we do with the same requirements. It was my goal to make it happen so the what if? started taking place in to my head. I decided to start from something I was feeding my dog almost every day in a variety of quantities and change it to a more nutritious-oriented choice. By having that goal plus my personal expierence , I took action and combined a very rich-nutrient treats diet that involved fresh farm veggies and fruits plus the addition of powerful antioxidants supplements needed. I started baking them at home and soon it became a passion to make these fresh, healthy , organic and all natural treats for my dog and to see how much she enjoyed them. The treats caught the attention of other dog owners, my friends, and the first bacth was made. I said , why not? putting it out there for a passionate dog owner who also go out of their way to do more for their pets, and that became my mission. Puppy Yummy's mission is to reach dog owners who are looking for natural healthy ways to improve the nutrition of their dogs by only focusing on the advances of science and the knowldge that we now have about how those antioxidants found in fruits and vegetables, and also with the right supplements, that can have a great impact in our beloved furry friend. There is evidence that improved nutrition strengthens the immune system and helps prevent cancer . There is data that says 1 in 4 dogs die from Cancer. Antioxidants in the body will be countering the destructive forces of free radicals and creating a barrier to protect your body. This can also be true for dogs .Their immune system will be allocating and destroying abnormal cells . His genes are making proteins to repair damage done by carcinogens. These natural processes help your dog fight cancer, but they need a helping hand themselves.You can do that by feeding a healthy diet . Research of these benefits have been tested in animals such as mice and dogs because of the huge similarities they have to us . They need to consume human - grade food that means if it is consumable for you , it will probably be for your dog. Puppy Yummy dog treats are done by someone who chooses the ingredients carefully for outstanding nutrition. We know how important is for your dog to receive the best , and the peace of mind you will get that for knowing what it is really in the food with no fancy names. However; what you feed your dog probably depends on how much you can afford ,and the time you will be willing to spend to prepare it. In Puppy Yummy one of our goals is to make it available for you, to give you peace of mind that love ,high quality ingredients and real farm fresh fruits and vegetables combined for a good result , yummy treats that will benefit your dog's life in the long run. Puppy Yummy wants to make the difference by educating green-minded people who love their dogs and recognize how fresh vegetables and the right supplements will impact their dog's life and also how important a well balance nutrition can affect your dog's quality of life. We also want to make a change in how we see ,as dog owners ,the treats we give to our dogs. They are a compliment in our dog's diet and if we don't know what it is in them and what they are made off , we are giving nothing but junk food to our dog. Just as we want our kids to get the best nutrition , dogs mean the world to us. Knowing how those different options of "super foods" can help your dog will make a change in you dog's health.